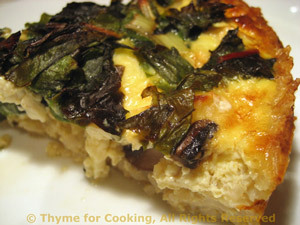 Easy Dinner from Thyme for Cooking: Pork and Chard Quiche. Once again, quiche with a brown rice crust. Even though the chard was cooked it still floated to the top. It's not as pretty as some, but great taste and perfect way to use leftover pork or chicken. 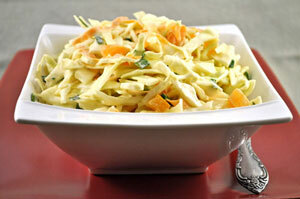 If you have any yogurt left after making the cabbage salad you can substitute it for some of the milk. The chard is quickly sautéed, mainly to help it fit into the quiche dish. You can use sautéed chicken breasts, leftover pork; chevre or Brie. This is a very flexible recipe. Cook rice in stock according to package instructions. When done, spread out on a plate for 5 minutes to allow to cool a bit. Lightly oil a 10" (25 cm) pie or quiche plate. 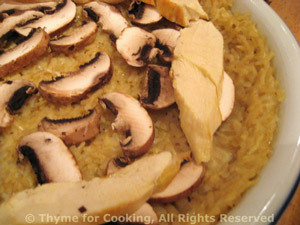 Add 1/4 cup shredded cheese and the cooked rice. Mix well. Bake in 400F (200C) oven for 8 minutes. Remove. Wash the chard and trim any bad bits. Stack the leaves together and fold over, the long way. Slice into thin strips, using both leaves and stems. Heat oil in a large skillet. Add the chard to the skillet and sauté until wilted and tender, about 7 minutes. Whisk eggs and milk together. Lay the mushrooms on the crust. 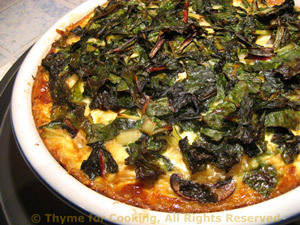 Top with the sliced pork, the cheese and the chard. Pour the egg mixture over all and bake for 30 - 40 minutes, until center has set. Remove and let rest 5 minutes. Note: When baking quiches or tarts, I put the dish on a sturdy baking tray, before pouring in the egg mixture, for easier handling. The dish can get very full. I always think of cabbage salad as summer picnic food. I am trying to expand my horizons. Plus, when eating seasonally, there are not a lot of salad choices in winter. This is a simple, yogurt-based dressing rather than the usual mayonnaise base. The carrot is optional, but I love the color! Slice the carrot into paper thin strips using the vegetable peeler. Put cabbage and carrot into a large bowl. In small bowl whisk yogurt, mustard and vinegar. Add oil, a bit at a time and whisk well. Add herbs. This will keep a week. Add half of the dressing and toss well to combine. Add more dressing according to taste and the amount of cabbage.